Bulgarian archaeologist, Prof. Kazimir Popkonstantinov, has discovered a unique medieval seal at the site of the Knyazhevski (i.e. "Princely") Monastery near the Eastern city of Varna. The seal is dated back to the 10th century and belonged to the Byzantine dignitary Antonius, who was an imperial protospatario in Constantinople. Antonius had correspondence with a representative of the Knyazhevski Monastery, who is believed to have been the Bulgarian Knyaz (i.e. king) Boris I (r. 852-889 AD) himself. 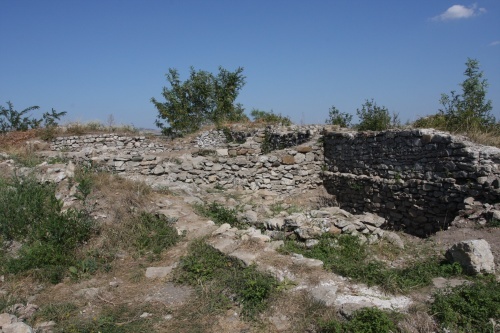 The team of archaeologist Popkonstantinov from the University of Veliko Tarnovo has also discovered fragments of Byzantine ceramics and a book lock near the seal, which is seen as a proof that the Knyazhevski Monastery was a scriptorium of the Bulgarian royal family in the 9th and 10th century when the Slavic literature was developed in the First Bulgarian Empire. During their excavations in the summer of 2009 so far, the archaeologists have discovered very well preserved monastery vaults from the 9th century. They have stated that those vaults were the only ones preserved in Bulgaria from the medieval monasteries, and that the scriptorium of what once was the Knyazhevski Monastery was the only one in the lands of the Byzantine Empire that was preserved so well. The Knyazhevski Monastery, located in the Karaach Teke area, is believed to have been the largest literary and cultural center in Northeast Bulgaria in the 9th-12th century. The archaeologists have discovered there over 40 book locks, pieces of parchment, lead seals. They believe that some of the disciples of St. Cyril and St. Methodius most likely worked there. Bulgaria's first formally Christian ruler, St. Knyaz Boris I Mihail, is believed to have been the sponsor of the Monastery in question. The First Bulgarian Empire (681-1018 AD) formally converted to Christianity in 863-864 AD even though large parts of the Bulgarian population are believed to have converted earlier. In 886 AD, Bulgaria welcomed three of the five disciples of St. Cyril and St. Methodius - St. Naum of Preslav, St. Kliment (Clement) of Ohrid, and St. Angelarius, who fled from Great Moravia, and brought the recently created Slavic script to Bulgaria. Under the auspices of St. Knyaz Boris I (852-889) and his son, Tsar Simeon I The Great (893-927), the Slavic literature in Old Bulgarian, also known as Church Slavonic, flourished and was later used when other Slavic states such as Russia and Serbia converted to Christianity.